Co-developed by Ren Ci Hospital and Tetsuyu Healthcare, the CARES4WOUNDS wound management application is capable of capturing 3D images of wounds, measure, record, monitoring progress and even provide treatment guidance. Created in response to the challenge of wound management in the community care sector in Singapore, the CARES4WOUNDS wound management application was developed and pilot-tested with 25 patients at Ren Ci Hospital and Tetsuyu Healthcare since November 2017, with good initial results. The hospital is the first in the Intermediate and Long Care (ILTC) services sector to deploy such a 3D wound management system. “We are able to reduce the time taken to measure and document the wounds by 50%. With the device we are able to capture the measurements more accurately, without having to use rules and probes and it is less painful for the patient,” said Madam Jenny Sim, Group Director of Nursing, Renci Hospital. 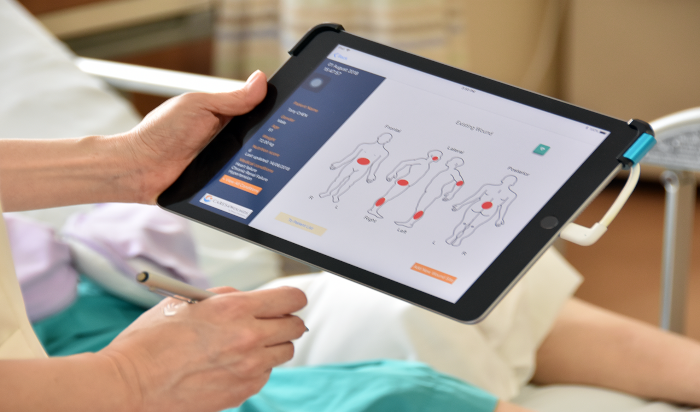 With the tablet application and 3D scanner, recording and storing the 2D and 3D images is straightforward – care staff can easily learn how to use the app and the proper way to measure wounds with a few hands-on practice sessions. Another benefit is the minimisation for the need of staff to write reports, which also helps with the standardisation of medical records. The app also facilitates clinical education as well. To be implemented in Ren Ci Nursing Homes in the first half of 2019, both patients and care staff will be able to benefit from the CARES4WOUNDS app, shifting away from the conventional method of manual wound measurement and observation. Currently, Ren Ci and Tetsuyu are continuing to improve on CARES4WOUNDS such as making wound measurement fully automated. In the long term, they hope to apply artificial intelligence to the app to help with infection detection and wound healing guidance.